Hazira LNG Private Limited (HLPL), a joint venture between Shell Gas B.V. and Total Gaz Electricite Holdings, operates an LNG receiving terminal in Hazira, which is a major port and industrial hub in India's Gujarat state. Commissioned in 2005, the terminal has two 160,000 m3 storage tanks along with re-gasification and auxiliary facilities that are capable of handling 3.6 million tons of LNG per year. This is the first LNG terminal in India to be built by global energy companies. A 22 km pipeline connects the Hazira terminal to the national gas grid at Mora Station. The pipeline has sectionalizing valve (SV) and LNG custody transfer metering (CTM) stations that are located 4 km and 14 km from the terminal, respectively. The control systems for the Hazira terminal are installed in its main control room (MCR), which handles all re-gasification processes and utilities, and at the jetty facility, where arriving LNG carriers are unloaded. The Hazira terminal's process, utility, jetty, and pipeline operations were all originally automated with a Yokogawa CENTUM CS 3000 process control system (PCS), a ProSafe-PLC safety instrumented system (SIS) with emergency shutdown (ESD) and fire and gas detection (F&G) functionality. The ProSafe-PLC was connected to the PCS via a MULCOM multiple protocol communication interface unit, an M-net bus (SIS control bus), and a V net bus (PCS control bus), with all these systems sharing the same human machine interface (HMI). 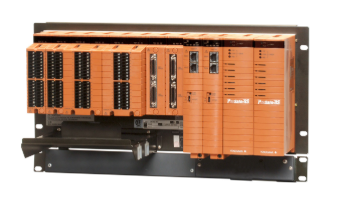 As the legacy ProSafe-PLC system was costly to maintain and was reaching its end of support date, Yokogawa India proposed that HLPL upgrade to Yokogawa's latest SIS offering, ProSafe-RS. After considering the merits of adopting the latest hardware and software, which included the use of a single control bus for all terminal facilities, the seamless use of the same HMI for both PCS and SIS, and improved safety and integrity, HLPL opted to go with Yokogawa India's migration proposal. HLPL was specific in its requirement that the ProSafe-RS system had to retain the same engineering philosophy used with the ProSafe-PLC system. HLPL also insisted that the migration project should leverage the latest advances achieved in the ProSafe-RS system software blocks. Yokogawa's PLC2RS tool for converting from ProSafe-PLC to ProSafe-RS applications proved to be extremely effective in fulfilling the client's requirement to retain the essential engineering features of the terminal's existing systems. The base application output by the conversion tool implemented all the latest features of the ProSafe-RS software. The engineering output was a perfect blend of the original engineering philosophy and the latest software features, and engineering time was drastically reduced. The key point was the need to replace just the SIS (ESD & F&G) while keeping the existing PCS and F&G mimic panel as is. This involved the removal of the MULCOM interface unit and ProSafe-PLC components and their replacement with ProSafe-RS components on a Vnet/IP control bus. To enable the use of the existing PCS network (V net), Yokogawa India installed an AVR10D V net router. The most challenging aspect of this migration was the software, which included special logic on the PCS for controlling the MULCOM interface unit. To reduce network load, Yokogawa India conducted a thorough investigation and was able to remove this logic without impacting the PCS logic. In addition, the MULCOM interface unit had ISA-F3A alarm indication logic for the F&G mimic panel. All of this functionality was successfully embedded in the ProSafe-RS system, and HLPL continues to use the mimic panel as an operation interface. For the project execution phase, HLPL inquired whether it would be possible for safety reasons to continue operating two boil off gas (BOG) compressors and a minimum send out (MSO) compressor. Yokogawa India took up this challenge in spite of the fact that the running/trip logic for this equipment resided on the existing ProSafe-PLC system, which needed to be disconnected as part of the migration. The company offered an innovative workaround by implementing this logic on a stand-in ProSafe-RS system that was temporarily hooked up to the existing PCS for the duration of the migration process. Following the completion of all migration activities, the data on the stand-in system was merged with that on the main ProSafe-RS system. Exhaustive planning coupled with clinically perfect execution helped Yokogawa India meet this client's demanding requirements with a minimum of disruption to terminal operations. As a result, both the BOG and MSO compressors were able to continue operating throughout the migration process. Given the limited amount of space available in the control and rack room, HLPL stipulated that the ProSafe-RS system must have the same footprint as the system that it replaced. It was indeed a challenge to fit the ProSafe-RS terminal boards into this space without compromising Yokogawa's high engineering standards. Yet another primary criterion for this migration project was the need to complete the entire migration during a planned eight day shutdown. This was not an easy task considering the fact that Yokogawa India had to migrate the entire SIS at the main control room and jetty, and hook this up with the original PCS. Thanks to the integration of the PCS and SIS, HLPL personnel are now able to use the same HMI for the PCS and SIS to operate the entire terminal. All the faceplates and other operation displays have the same design. This helps to eliminate operator errors and allows HLPL's engineering team to use the same engineering environment to make configuration changes to the PCS and SIS, reducing both engineering workload and maintenance costs. A key factor in the success of this project was the micro level planning for the site erection and commissioning activities and the clear definition of roles and responsibilities for each member of multilevel teams that worked round the clock. "The Yokogawa team performed the engineering, design, pre-FAT, and FAT so well that the site installation and commissioning were flawlessly completed. This was an important aspect in ensuring that the installation and commissioning were completed by the targeted completion date. The team's excellent knowledge and commitment were also visible in pre-shutdown activities, where many activities had risks of manual errors that could cause a process shutdown; however all these activities were completed impeccably." "The project was very challenging as it had to be completed in eight days and had to be integrated well with other HLPL shutdown activities. The Yokogawa team's meticulous planning and flexibility in making necessary schedule changes helped a lot in preventing conflicts with other concurrent shutdown activities. Yokogawa India's customer focused approach is highly appreciated."